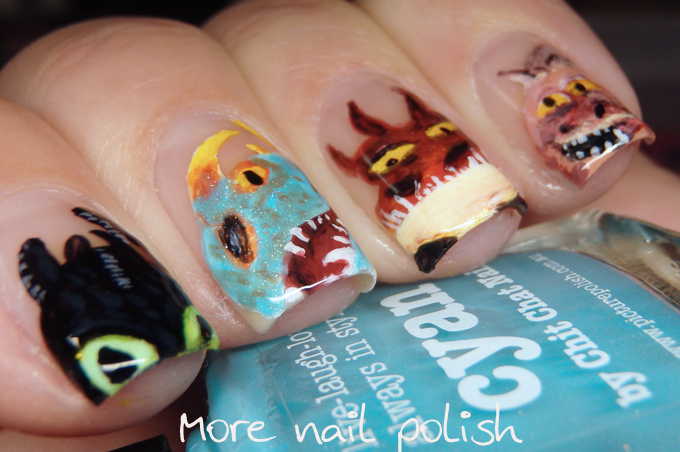 I've made it to day 5 of the Mythical Creatures week, and for my final mani I really pushed myself for a full freehand design. 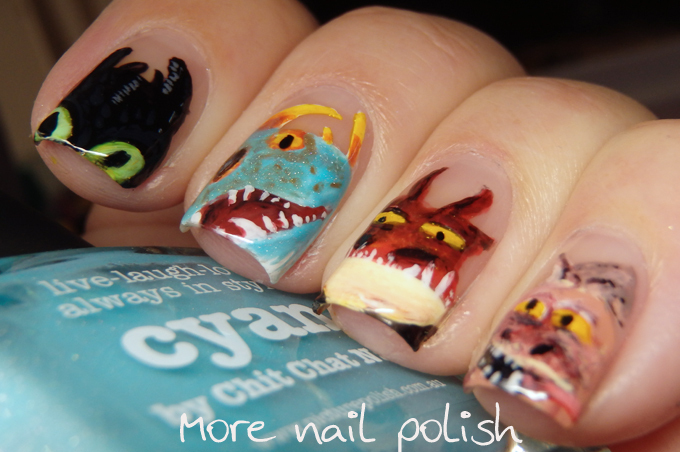 Like many of the other manis this week, I chose dragons as a prompt, but my dragons are a little bit different. My daughters current favourite show is Dreamworks Dragons, which all started with the How to Train Your Dragon movie, and then followed with 8 seasons and another movie. She binge watched season six on Netflix last weekend and is now busting for the third movie to come out. Although I am a bit worried it's going to be a bit of a sad ending with Hiccup and Toothless both going their different ways. Anyway, I painted four of the main five dragons here. I could pretend that I painted Barf and Belch on my thumb, but we all know I secretly only painted four nails just to post here.! 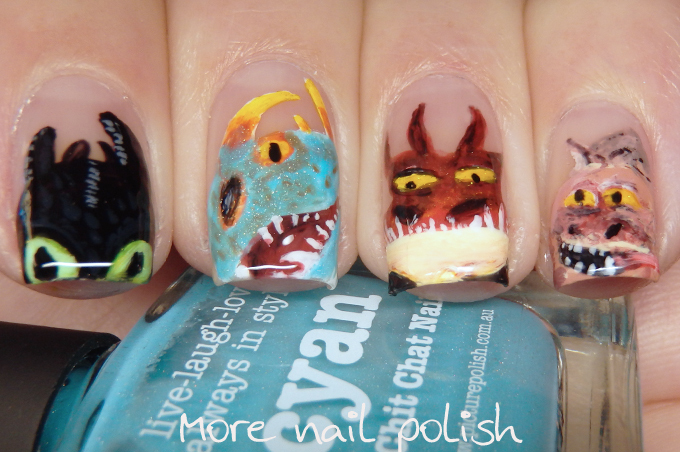 So here they all are, Toothless, Stormfly, Hookfang and Meatlug, all in their freehand painted glory. 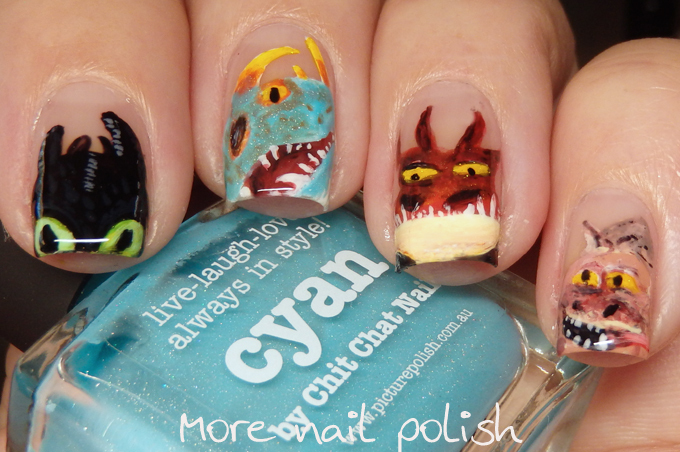 Yay, Toothless!! All your dragons are so sweet and cute, but Toothless has a special place in my heart. These ROCK.